So you’ve decided to make your party really special and have a live magic show. So how do you decide which magician to book? You can take some comfort in knowing this is a common situation since most people have never hired one. But complicating the issue is most magic shows are at private parties so you probably will be hiring someone without seeing his/her show. Here are some steps to take to ensure Mr. or Ms. Magic will be a hit with your guests. 1. Ask around. You may get lucky and find a friend who just loved a local magic show they recently attended. If you like what your friend says, you may have already found your magician. If you can get the magician’s name, search for his contact information online. 2. Whether or not you have a referral from a friend, a website is a great way to filter magicians in your area. The website should be attractive and include your type of event – for example, a child’s birthday party. Is the site completely serious and dramatic? That person may be fine for an adult audience but that’s probably not the kids’ magician you’re looking for. Do the photos of the magician show someone you’d want as your living room entertainment? 3. Call a few of the good candidates. Talking to a magician is a good way to get an idea of what he is like. If you left a message, did he return your call as he said? 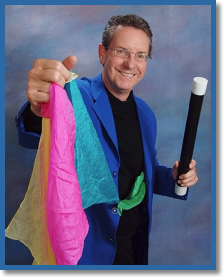 Does he instill confidence that he is an experienced entertainer who will be a wonderful addition to your party? Does he answer your questions adequately or does he come across rushed and make you feel like an inconvenience? If the party is for a child’s birthday, does he mention anything special he’ll do for your child, like having the child help with a special magic trick? Trust your intuition; this may be more of a feeling you get rather than one particular thing he says. 4. Select one and set up the details! Posted in Tips on Hiring a Birthday Magician.